California, home to Silicon Valley, has enacted the nation’s toughest net neutrality protections and will have to defend them in court. You think government doesn’t work on weekends? Think again. On Sunday, California Gov. Jerry Brown signed the nation’s toughest net neutrality law, which includes protections tougher than the Obama-era federal rules that were repealed by the Trump Administration’s FCC. Also on Sunday, the U.S. Department of Justice filed a lawsuit on behalf of the FCC claiming the law is both unconsitutional and barred by the FCC’s rule forbidding state and local governments from imposing net neutrality protections. However it turns out, the litigation is an opportunity for the tech world to learn about the Constitution's commerce clause and the Tenth Amendment. But first, some background. In 2015, during the Obama Administration, the FCC approved a sweeping net neutrality rule that imposed regulation on internet service providers (ISP) as public utilities. The rule required ISPs to treat all content equally, meaning a startup angling to be the next Netflix or Amazon would have the same bandwidth as the behemoths they are challenging. Last December, the FCC under Chairman Ajit Pai, a former lawyer for Verizon, voted to repeal the rule. The bill signed by Brown enshrined that principle into California law. A number of states, California among them, are challenging the FCC repeal of the net neutrality rule in federal court. 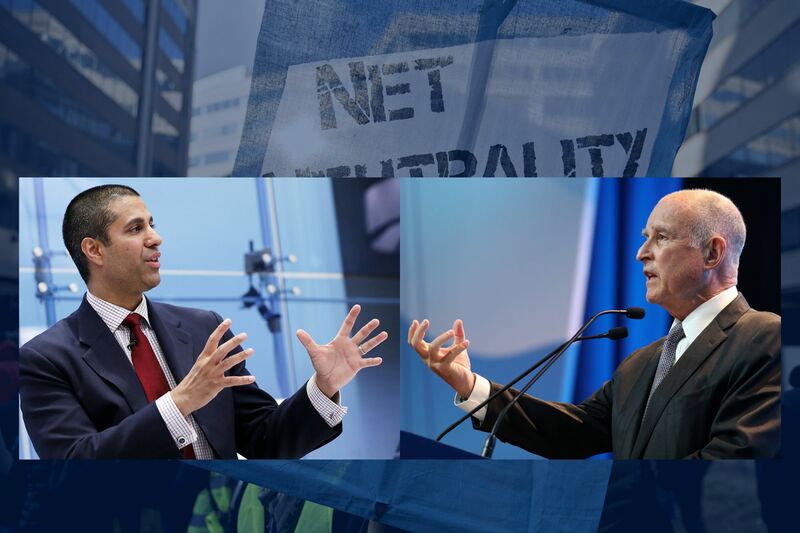 Meanwhile, it is widely anticipated the ISPs, which pushed for a clause in the FCC repeal specifically banning states from enacting their own net neutrality legislation, will file their own lawsuits challenging the new California law. California Attorney General Xavier Becerra, who is overseeing many lawsuits against the Trump Administration, said California will not back down. "While the Trump Administration continues to ignore the millions of Americans who voiced strong support for net neutrality rules, California — home to countless startups, tech giants and nearly 40 million consumers — will not allow a handful of power brokers to dictate sources for information or the speed at which websites load," he said. The litigation can be seen as part of the eternal wrangling between the states and federal government over the extent to which the Tenth Amendment (“The powers not delegated to the United States by the Constitution, nor prohibited by it to the States, are reserved to the States respectively, or to the people.") allows states to regulate their own commerce. California, for instance, set auto emission standards for cars sold in the state prior to Congress passing the Clean Air Act in 1970. As a result, California retains the authority to set tougher tailpipe standards than federal standards and each state can choose to require cars sold within their borders meet the tougher California emission rules. The Trump Administration, as part of its rollback of Obama Administration auto emission rules, is seeking to strip California of its authority to set those tougher standards.